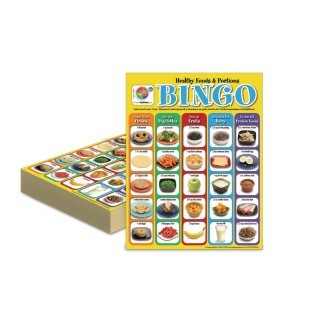 Promote USDA MyPlate and correct portion sizes with this colorful and fun Bingo game for elementary-aged students. The images on the bingo cards are photographs of portions of healthy foods in each food group, which help students identify what their plates and bowls full of food should look like. 30 laminated Bingo cards, 8-1/2” x 11”. Appropriate for Grades K-5.